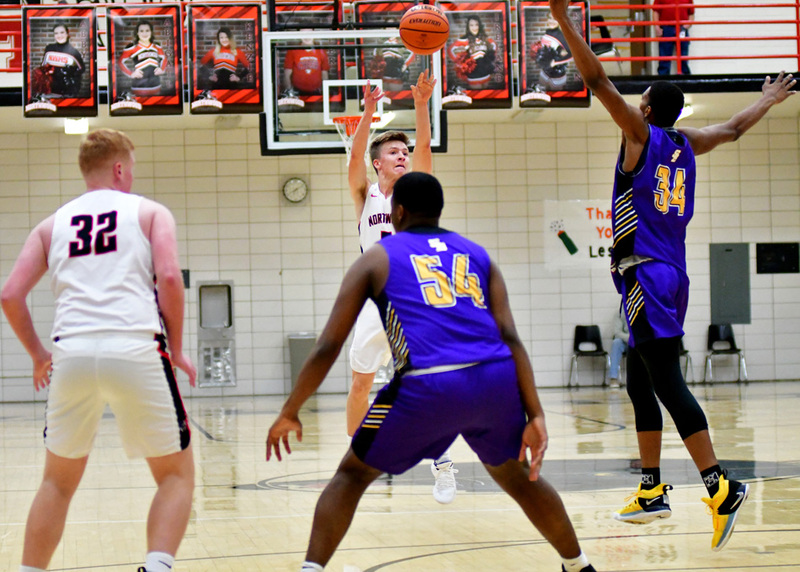 NAPPANEE – It was triple the fun for NorthWood in its 64-39 boys basketball win Friday night against South Bend Clay at The Pit. On the court, the Panthers were sizzling hot from behind the three-point arc, hitting 10-15 attempts. At halftime, Kevin Edwards nailed a half-court shot on his only try to win a cool $250. Even public address announcer Mark Mikel may have cunningly slipped in Weezer’s cover of “Africa”, with the line harmoniously repeating, “I blessed the rains”. It was raining down threes all over The Pit. Ben Vincent and Nick Bean hit key treys in the second quarter to help NorthWood pull away for good. With Clay’s Anthony Neal commanding the post, blocking a trio of shots in the quarter, the Panthers had to look outside the box. And it did, with Vincent burying a three then Bean getting a dish from Vincent for an open look at a bomb just before the half. A 24-point quarter had the Panthers up 38-20 and well on their way. Clay’s Jaylen Harris blocks Brock Flickinger. Eight of NorthWood’s threes came in the first half, four of its first five field goals came from behind the arc. Wolf remarked the size of Clay, which had 6-7 Neal, 6-5 Jonathon White and 6-4 Allan Prestly lurking near the hoop, provided a wrinkle for his Panthers that had the 5-9 Vincent, 5-8 Brock Flickinger and 5-11 Bean looking for room elsewhere. 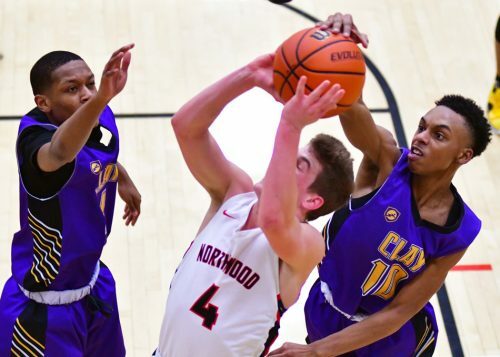 How his team adjusted was key, which carried over into the second half where Clay’s insistence to push the pace didn’t deter NorthWood from its game plan and system. Vincent ended up with 20 points and Bean 15 points to lead the charge for the Panthers, the two a combined 7-10 from deep. Flickinger had nine points, six rebounds, five assists and a steal in almost a full 32 minutes of play. Jaylen Harris led the Colonials with nine points while Neal had eight points, four rebounds and four blocks. Clay didn’t have a player reach double figures in the JV game, but had seven score at least one bucket in a 37-33 win. Tomias Hunt led the Colonials with nine points while Caleb Schwartz had 14 points for the Panthers. NorthWood (4-6) ends a five-game slide with a home date against Wawasee on Jan. 4. Clay (2-8) has dropped three straight and will gear up for a game Jan. 10 against South Bend St. Joseph’s.